A multinational team led by the Department of Energy's Oak Ridge National Laboratory Climate Change Science Institute has found the first positive correlation between human activity and enhanced vegetation growth. "This is the first clear evidence of a discernible human fingerprint on physiological vegetation changes at the continental scale," Mao said. With the absence of long-term observational records and suitable Earth system model (ESM) simulations, the human "touch" on northern latitude greening had not been previously identified. 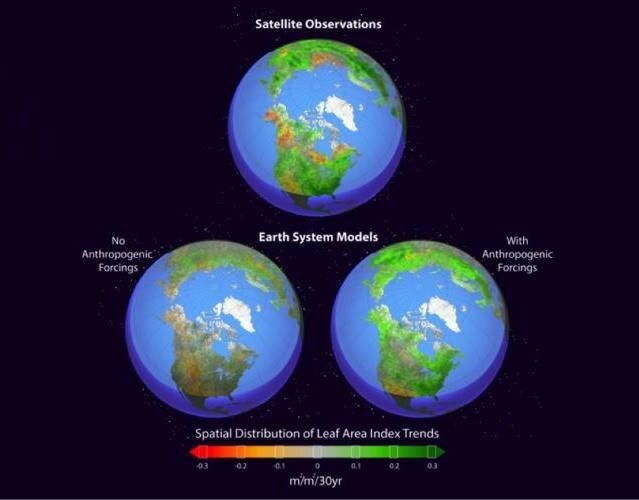 The team used two recently available 30-year-long leaf area index data sets, 19 ESM simulations and a formal "detection and attribution" statistical algorithm to positively attribute changes in vegetation activity in the extratropical Northern Hemisphere to anthropogenic forcings, or human-induced climate inputs such as well-mixed greenhouse gas emissions. Leaf area index -- the ratio of leaf surface area to ground area -- is an indicator of vegetation growth and productivity derived from satellite imaging. The remote-sensing-based LAI datasets and ESM simulations showed a significant "greening" trend over the northern extratropical latitudes vegetated area between 1982 and 2011, indicating increased vegetative productivity. When Mao and his colleagues accounted for internal climate variability and responses to natural forcings such as volcanic eruptions and incoming solar radiation, it was clear that the greening was inconsistent with simulations of purely natural factors and could only be explained by anthropogenic greenhouse gas forcings, particularly elevated carbon dioxide concentrations. This anthropogenic greening effect has the potential to alter natural processes on a planetary scale. Continent-wide changes in vegetative productivity, such as those in the study, impact energy exchanges, water use and carbon budgets, accelerating or slowing the pace of climate change. Accurate detection and attribution of changes in vegetation growth patterns are essential for strategic decision-making in ecosystem management, agricultural applications and sustainable development and conservation. This is the first time the detection and attribution algorithm has been applied to terrestrial ecosystem changes such as leaf area index trends, as it is typically used to study physical climate data such as extreme events and variations in temperature or precipitation. Mao would like to see these long-term regional- and global-scale observational data sets used in similar studies as they become available. He says the detection and attribution algorithm could be applied to study broad-scale terrestrial ecosystem dynamics, and the framework developed for this study could be used to identify and correct potential errors in next-generation ESM simulations.